A documentary chronicling sports legend Lance Armstrong’s improbable rise and ultimate fall from grace. 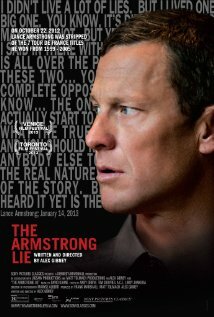 A fascinating documentary about Lance Armstrong, originally conceived as a film about his 2009 comeback, before becoming something altogether different in light of the revelations about Armstrong’s steroid abuse that led to his 7 Tour de France titles being expunged from the record books. It’s a terrific documentary on two counts. Firstly, as a character study of Lance Armstrong, the sportsman, and of Lance Armstrong, the person. It’s incredibly interesting to see interviews with him before the truth came out, and comparing them with more remorseful interviews after the now famous appearance on Oprah’s chat show. Director Alex Gibney is very candid in his approach and doesn’t shy away from asking the challenging questions, and in fairness to Armstrong, he mostly tries to answer them. He was clearly an incredibly driven man, willing to do everything he can to succeed, and undoubtedly his work for cancer charities has achieved a lot of good, but that doesn’t change the fact he’s cheated, and he’s let down a lot of people who he had previously inspired. The second count relates to the sport of Cycling as a whole, and the massive problem it has had (and perhaps continues to have) with steroid abuse. When Armstrong won his 7 titles, the problem in the sport was so endemic that there’s a good argument that he (and other riders) felt they had to cheat to compete, which creates an interesting parable that perhaps in a drug free situation, Armstrong may well have still won. The documentary is fascinating for anyone with an interest in Lance Armstrong or the sport of cycling, but also for anyone interested in the drive for success and people who will pull out all the stops to reach their goals, even if that involves cheating. It doesn’t make you respect Lance Armstrong, but it does make you understand him more, and the style of the documentary which combines talking heads, race footage and jumps from present day interviews to the past, helps to create this. Highly recommended.